Present state: The only evidence of the platform is a single course of bricks at ground level. The stationmaster's house which originally incorporated the station offices is in private occupation. Notes: Initially there were no plans to provide a station between Pilmoor and Coxwold and in 1852 request to build a station alongside the Easingwold - Thirsk road were refused. A gatehouse was provided on the minor road running north from Husthwaite village. A passenger ticket is recorded in late 1854 but it is not know if there was a station by this date or if the train just stopped at the crossing. The station didn't appear in a public timetable until February 1856 and even then it was only as a footnote. 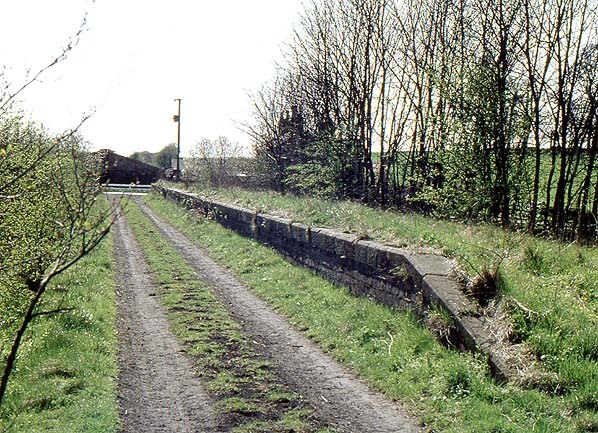 The station had a single platform to the north of the level crossing on the 'down' side of the line with an open waiting shelter. The stationmaster's house was set back from the line on the opposite side of the crossing and incorporated the station offices. 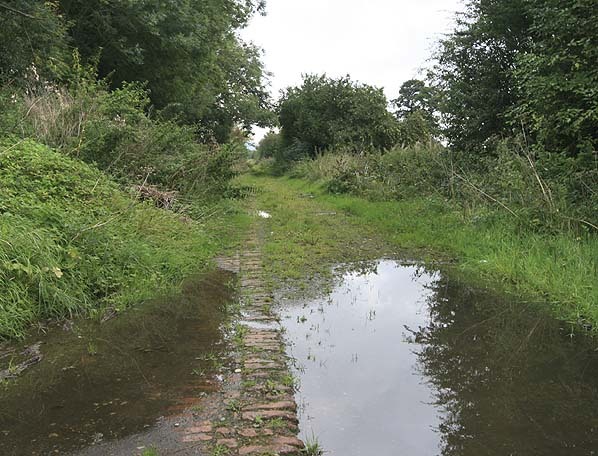 Requests for a goods siding were at first rejected by the NER but a single siding was eventually provided on the south side of the crossing largely paid for by local land owner Sir George Wombwell for his and his tenants private use. In 1872 the siding was available for public use and Sir George's contribution was refunded. The siding was lengthened to accommodate 5 wagons in 1890 but there were no facilities apart from a weighbridge. In 1890 a timber booking office, goods warehouse and ladies waiting room were built on the platform. 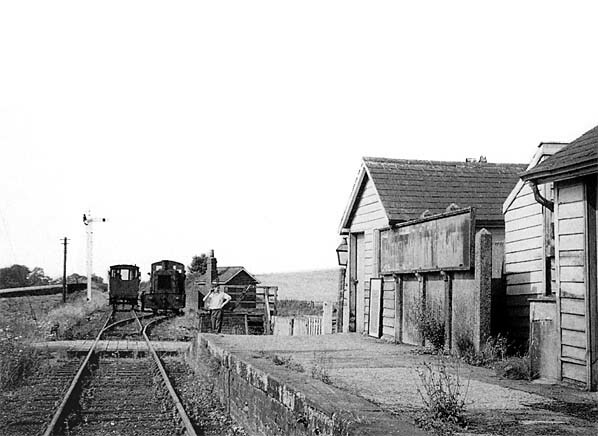 After closure to passengers the station remained open for goods traffic with a porter until October 1963 when it was downgraded to an unstaffed public delivery siding. Although closed to passengers in 1953 the station saw regular passenger use 28th June 1962 with a range of excursion trains using the station, these included shopping, ramblers and football excursions, Sunday school outings to Scarborough and the usual enthusiasts excursions. In 1845 three schemes were proposed to bring railways into the Vale of Pickering, the successful scheme was the Newcastle & Darlington Junction Railway, a 23 mile two track line between Thirsk and Malton running from a junction with the Great North of England Railway three miles south of Thirsk to a junction with the York - Scarborough line at Norton from where a half mile branch would run into a terminus at Malton; the proposed line included a 5 mile branch from Gilling to Helmsley. The line received Parliamentary approval on 18th June 1846 but construction was delayed for some years while the company settled on its exact route. From the outset the success of the line was linked with the Malton & Driffield Railway which gained its act on 26th June 1846. The two lines would form a continuous route between Driffield and Thirsk forming part of a new 'main line' between Hull and the north east. was little enthusiasm for the T & M and eventually the time limit for building the line imposed by the 1846 Act was allowed to lapse. Following near bankruptcy, work on the M & D eventually started despite the lack of progress on the T & M and it was suggested that the MDR should take over construction but, instead, a writ was served on the York Newcastle & Berwick Railway to force them comply with an earlier agreement to start work on the line. A new Thirsk & Malton Railway Bill was put before parliament and work finally started on 1st October 1851. There were numerous changes to the original plans and a more modest route was eventually selected running from a north—east curve at Pilmoor, six miles south of Thirsk to Scarborough Road Junction at Malton where trains would run over M & D metals into Malton removing the need for a separate terminus. In order to reduce costs the Helmsley branch was also dropped and the line was downgraded to single track even though sufficient land for a double track line has been purchased; this ensured that it would never become a trunk route. Progress on the two lines was now rapid and they were both completed in 1853 with a Board of Trade inspection taking place on 10th May which required improvements to the timber bridge over the River Derwent at Malton. Before these improvements were implemented there was a joint official opening on 19th May. The first train carrying shareholders and invited guests, ran from Pilmoor through Malton to Driffield and then back to Malton. The additional work was completed by 26th May but the exact date of the first public train is uncertain. The goods service had started on 21st May and a shareholders meeting reported that the line opened to passengers on 1st June although a more likely date was 21st June although some stations were still unfinished. with one daily pick-up goods train and from 1860 a daily mineral train. Intermediate stations were provided at Coxwold, Ampleforth, Gilling, Hovingham, Slingsby, Barton-le-Street and Amotherby an eighth station at Husthwaite Gate at the west end of the line opened in 1856. Two of the 1845 schemes for the western part of the vale included branches to Helmsley & Kirkbymoorside on its northern edge but these were not built. In 1862 the Ryedale Railway was promoted from Hovingham on the T & M to Helmsley, Kirkbymoorside and Pickering but this was dropped following a lack of co-operation from the NER although the route was similar to the line later built by the NER. That company’s original Act for the branch in 1866 was designed to oppose a rival scheme through Helmsley that would have linked Leeds to Teesside. Once that was defeated, the NER proceeded slowly, even trying to back out of the project in 1868. However, by 1871 it had opened a southern curve at Pilmoor and the new branch between Gilling and Helmsley opened to passengers on 9th October 1871. This was extended to Kirby Moorside (the town is called Kirkbymoorside) on 1st January 1874 and finally through to Pickering on 1st April 1875; additional stations were provided at Nunnington, Nawton and Sinnington. Apart from the pick-up goods the main freight traffic handled by the two line was coal, animal feed and timber which was the main commodity handled by several stations. A large amount of limestone was also transported from the quarries on the Malton & Driffield line bound for the blast furnaces at South Bank and Redcar. There were numerous improvements to the line in the late 19th and early 20th centuries but by the turn of the century traffic was already in decline and after WW1 both goods and passenger traffic suffered following the rapid development of road transport with passenger numbers halving between 1904 - 1927. In 1885, 115,965 passengers booked tickets from stations on the T & M and its Pickering branch, by 1938 there were only 27,451 and by 1929 the four stations between Malton & Gilling earned only £538 in passenger revenue. Initially most trains ran from Pickering to Gilling where passengers could transfer to the Thirsk & Malton line but there were soon through trains to York using the southbound Pilmoor Curve to Bishophouse Junction, but these only ran from the Pickering branch covering the westernmost 12 miles of the T & M line. By 1895, there were four such trains daily and the line between Gilling and Malton was already the ‘poor relation’. Its trains to Thirsk ended by 1914 and nine years later it was only a feeder for the York—Pickering service and even this function ended on 30th December 1930, when the four stations between Gilling and Malton closed to passengers to save costs. The final train consisted of one coach that carried four passengers; the stations remained open for goods traffic. remaining section of the line but this dropped off quickly after the war as road transport continued to make inroads into the rapidly declining passenger and freight receipts. Ampleforth Station closed in June 1950 and in 1952 there were rumours that the York - Pickering service was under threat as the line was running at a loss with many passengers being lost to the more convenient bus services. Closure was announced for 2nd February 1953 with the last train running two days earlier. With the exception of Sinnington the remaining stations remained open for freight traffic and special passenger excursions from the west. The line between Kirbymoorside and Pickering was closed completely and the track was lifted shortly afterwards. The only passenger trains after 1953 were special excursions including Ramblers’ Excursions to Kirbymoorside from West Yorkshire, the last of which, quaintly titled ‘Special Ramblers’ Daffodil and Primrose Diesel Excursion’, ran on 3rd May 1964. In the early 1960’s there were also special trains out from the area, chiefly from Helmsley as far as Largs, London and King’s Lynn and more modest Sunday school outings to Scarborough. The last of these ran on 27th July 1964, and two weeks later the line closed altogether. The line also had two quite different ‘main line’ workings. The boys’ boarding school of Ampleforth College is situated between Ampleforth and Gilling stations. In 1895 the NER built a 3' horse drawn tramway from Gilling Station to the college mainly for freight traffic as the college produced its own gas requiring 500 tons of coal a year. Special open wagons were also provided to carry pupils. In 1923 the college went over to electric lighting and the gas works closed and the tramway was taken out of use. From the 1930’s up to 1964 there were two special ‘school trains’ at the beginning and end of each term, usually to and from London King’s Cross and Leeds or Liverpool, with one to summer camp at the end of July. The northbound junction with the East Coast Main Line was not replaced after an accident in March 1963 and so the Thirsk & Malton line lost its last through passenger trains. Goods traffic ended on 7th August 1964 and the line was completely closed from the 10th August with the exception of the 3 ½ mile section of line between Amotherby - Malton which remained open until 17th October to honour an existing long term freight contract. Track lifting started at Kirbymoorside on 29th March 1965 and was completed on the 9th August. Demolition of the viaduct over the River Derwent started on 22nd August and the bridge over the York - Scarborough railway was removed on 19th September 1965, the final nail in the coffin of the Thirsk & Malton Railway and the railways of Ryedale. 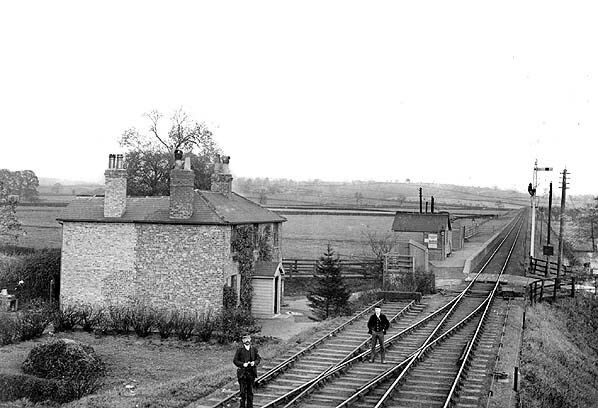 Looking north east towards Husthwaite Gate Station in c.1908. The stationmaster's house which incorporated the booking office is seen on the left. It is interesting to note that station is shown to the south of the level crossing while the platform was actually sited to the north of the crossing. This is a common feature on OS maps when the booking office is on one side of a crossing and the platform is on the other side although at Husthwaite Gate a booking office was provided on the platform from 1890. Husthwaite Gate station looking south west in April 1976. The stationmaster's house/booking office was set well back from the line and is just visible behind the trees. Husthwaite Gate Station looking north east in September 2008. Although the platform has been demolished a course of bricks is still visible at ground level.